Monday, we remembered and gave thanks for the legacy of Dr. Martin Luther King, Jr. His leadership and vision changed the course of this country forever. What an incredible legacy to count in our history. Sometimes I wonder what things would be like today if he were still alive. Of course, there’s no real way to know. I sometimes find it distasteful when people try to politicize MLK in terms of modern-day politics. I hear people say “MLK was a Republican! 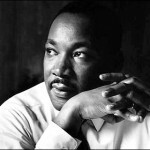 He’d be against XYZ…” or “MLK was a Republican but would be a Democrat today if he were still alive”. The point is, MLK is not alive today; and while it certainly is of no comfort to his grieving family, perhaps it is a small mercy in regards to his public legacy that he was taken so early. We can’t politicize his enormous contribution. There are no YouTube videos or Tweets from MLK we can look at to determine his political position. It’s common knowledge now that MLK was an adulterer, and yet we rarely talk about that because the gravity of his legacy far outweighs the flaws in his character. He is not here to prompt nosy bloggers to dig into his private affairs and publicize details that would shift his public image. In that sense he remains, and always will remain a true Unifier; a warrior for justice and freedom. As Americans of any position on the political spectrum, we can all look to MLK for vision and inspiration. We can all agree that he is one of the most important and heroic figures in world history. We can all agree his fight for freedom was worthy, monumental and invaluable. It’s sad to lose someone so incredible so soon. Although we never knew him personally, so many Americans still grieve MLK’s loss. So don’t view this post as a “I’m glad he’s not with us” post. These are just words I tell myself when I find myself saddened that such a great leader was stolen from us. In the end, MLK Day is not about politics, but about freedom and determination. It’s a testament to a wise God who takes us as we are, flaws and all, and turns us into heroes.